I got an OLPC XO-1 a few days ago in the mail as part of the give one, get one program. Hopefully some child out there is enjoying their new laptop–there’s a certain amount of opacity in the process so I have no idea even if this laptop went to some needy far-flung village in a developing nation, as most of the propaganda would have you believe. I don’t mean to be too critical; I recognize that proper allocation of charitable resources is one of the most difficult tasks anyone can attempt, but a donation the magnitude of the laptop, even if it is only $200, is big money in the most needy countries. I somehow hesitate to think if I shouldn’t have just given a check to UNICEF instead to provide medicine to newborns. Then again, as long as one laptop is being delivered to somewhere that’s needy, I’m not doing bad compared to some other charities, where often more than half the donation is retained to cover management fees and fundraising costs. I also got a laptop out of this…so for whatever reason, Negroponte’s logic was successful in convincing me. Well, the point of this blog isn’t to discuss the merits of charities. 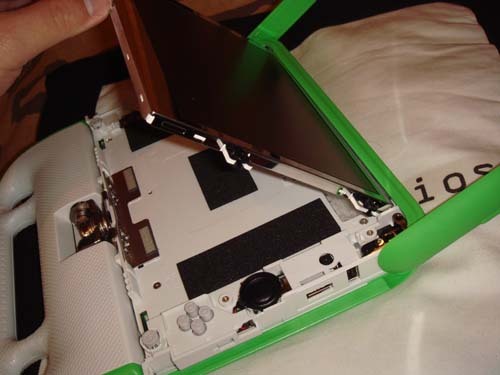 We like hardware, and the OLPC XO-1 is an interesting piece of hardware. There are plenty of teardowns for the OLPC XO-1 (including one on the OLPC wiki itself), so I won’t repeat the tedium of what screw comes out of where and just cut to what I thought were interesting highlights. If I were to make one general comment about the OLPC XO-1, it’s that its mechanical design is brilliant. It’s a fairly clean-sheet redesign of traditional notebook PC mechanics around the goal of survivability, serviceability, and robustness (then again, I’ve never taken apart any of the ruggedized notebooks out there). When closed up for “travel”, all the ports are covered, and the cooling system is extremely simple so it should survive in dusty and dirty environments. 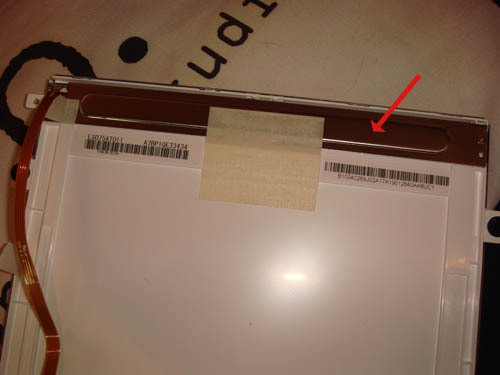 Significantly, the port coverings aren’t done with rubberized end caps that you can lose or forget to put on–they are done using the wifi antennae, and the basic design causes the user to swivel them back to cover the ports when they are packing up the laptop to go. That’s thoughtful design. 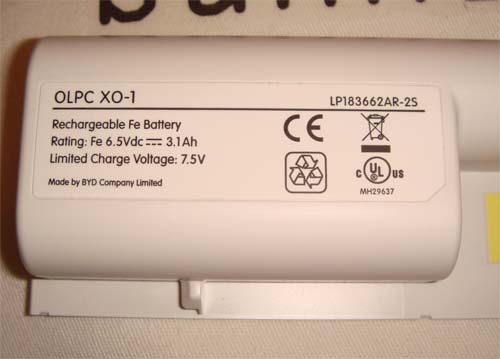 The OLPC is one of the first devices to use the Li-Fe-P battery chemistry. My understanding is that it’s safer than normal Lithium Ions (and those who have been reading the chumby fora are aware of my liability and safety concerns around putting a Lithium Ion battery into any device), but it has a lower capacity. 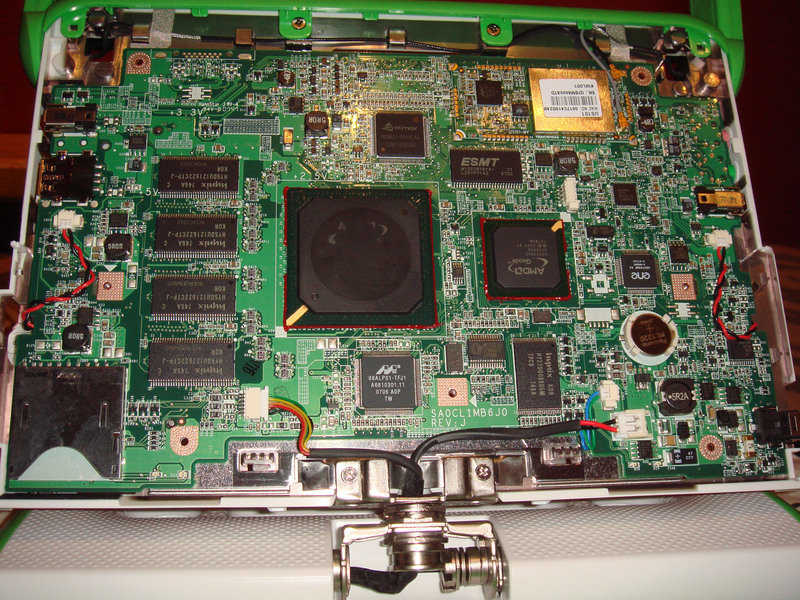 Unlike most other laptops, the OLPC is easy to take apart and service–something important for a device you are sending to a remote region of the world. The LCD, which is shock mounted, was clearly designed to be easy to replace if it was broken–a few screws to remove, some panels to slide off, and you’re done. This is unlike my T60p, where even the trained tech who did the warranty repair on it couldn’t quite put humpty dumpty back together again. The display is made by Chilin (which is related to Chi Mei, one of the major LCD glass manufacturers–the current chumby’s glass is made by them as well). I had the fortune of meeting Scott Song from Chilin at China FOO, and he was telling me some of the interesting yet lesser-known features about the LCD. In addition to the celebrated dual-mode monochrome/color transreflective layer stack used by the panel, it also features a removeable backlight LED bar. 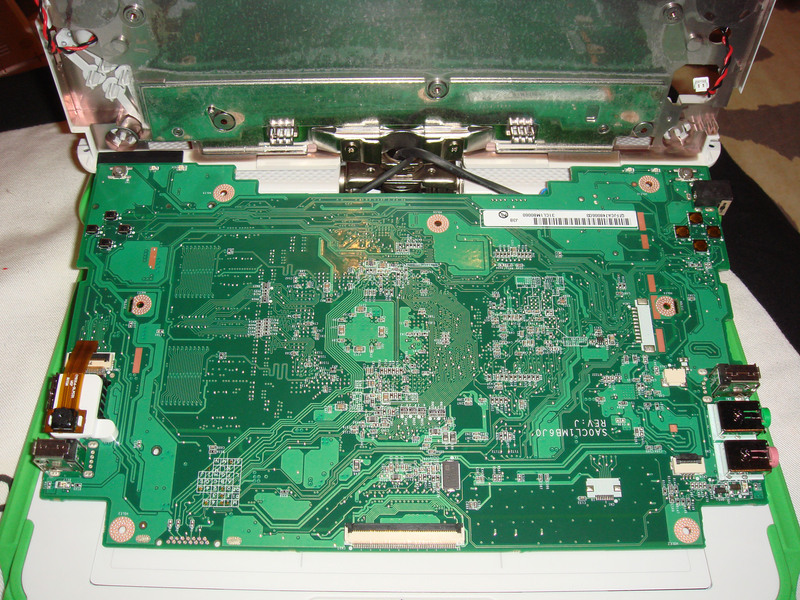 Aside from mechanical abuse, the most common failure mode for an LCD is the backlight burning out. 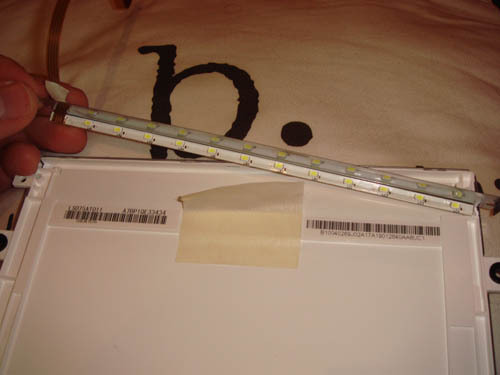 Most LED backlights are rated for only about 10,000 hours–if that–and it’s expensive to trash a whole LCD for the failure of a fifty cent component. 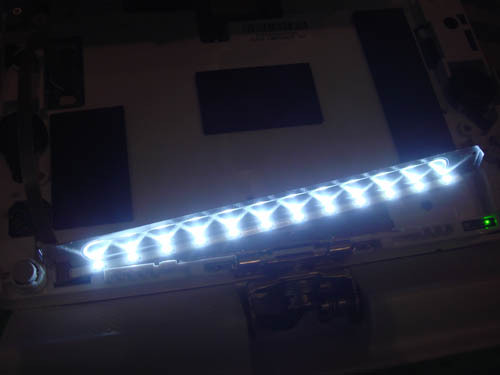 Therefore, the backlight bar was designed to be easily replaced. I gave it a whirl on the OLPC, and it certainly lived up to its expectations. Usually, to get to the backlight bar, you have to risk destroying the LCD panel, but in this case, two screws was all it took. I decided to fire up the backlight outside the display, and let me tell you, that sucka is bright. Note that the photo above wasn’t taken in the dark–it’s just that the camera shutter had to tighten up so much so that the background looked dark. If I were in the third world, I probably would say screw the laptop, I’m taking the backlight bar out and lighting my home with it! 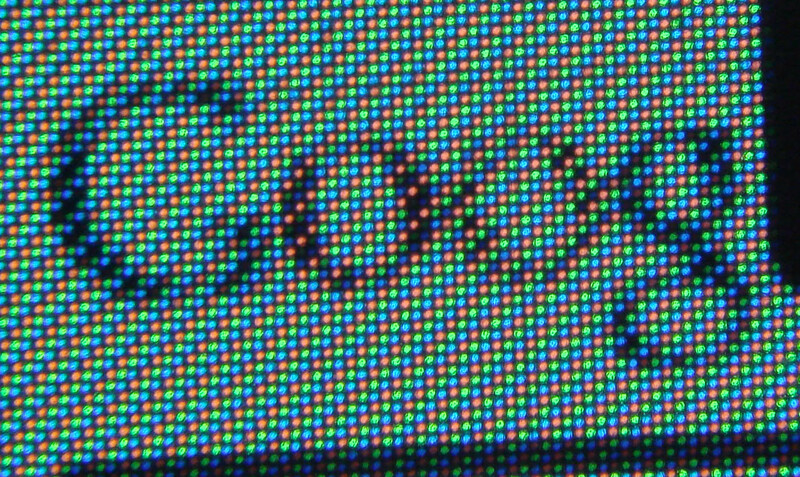 Here again is a close-up of the pixel array used by the transreflective display (click on the image for a much larger version). One very slick thing about the OLPC software is that I can hit a button on the lower left hand corner and it will rotate the display rendering by 90 degrees each press of the button. This allows me to easily fold the display back and use it as a sunlight-readable eBook device. Thanks in part to the low power of the Geode CPU, the design mounts the motherboard against the LCD, unlike most laptops where the motherboard is under the keyboard. This configuration has some simplicity advantages, especially considering the flexibility required by the display unit that can be flipped 180 degrees in either direction. The heatsink for the CPU consists simply of a thin metal heat spreader, which is in close proximity to the plastic casing: no cooling holes, fins, or fans to collect dust and break (notice how the Intel Classmate PC features prominent cooling holes for its under-keyboard CPU module). It also doesn’t burn your lap up while you are using it (although the display still does get quite warm when you use it–I tucked it into my jacket once to keep me warm while running around outside in the cold). Notice how both of the large BGA chips are underfilled to provide better shock and vibration robustness. I actually have never seen an underfill like this before–it seems to be oozing out of the edges–and it also doesn’t seem to be very uniform (some spots seem to have a little underfill missing). Most underfills I’m familiar with to attempt to cover every gap and void underneath a chip (which is actually a very hard process problem); maybe this is some new kind of underfilling technique that expands a little bit upon cure to help cover voids and its robust to a few missing spots. If a reader is familiar with this type of underfill technique, I’d appreciate a link to it. 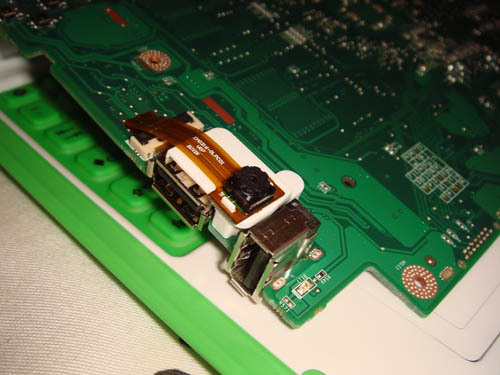 A little trivia here–this is the same chipset used inside the Microsoft Xbox360 Wireless Networking Adapter. Presumably Microsoft doesn’t use the programmable ARM core in the Marvell 88W8388 to do something as magnanimous as bringing mesh wifi networking to the third world–probably it’s used to help implement security authentication to support their high ASPs for their closed accessories and to implement Microsoft-enhanced protocol tweaks that helps lock out competitors. Engineers make guns, they don’t tell you where to point them–that’s up to the marketing guys. Hackers take these guns apart and use the barrels and stocks as tubing and lumber to build functional art. Sometimes the art includes a bigger gun or a barrel that points backwards, and often it’s up to the media to interpret what this cryptic art means. Really, most of the time, it was done just because it’s fun to make art, but that doesn’t sell copy. The OLPC’s wifi sensitivity is really quite excellent–the dual antennae clear of the laptop’s body do wonders for sensitivity. On the other hand, I had some trouble getting the native UI to associate the OLPC to my access point, and to get it to stay there. Overall, the software on the OLPC is clever but very “appliance-like”: there are some pre-loaded applications and it’s not immediately obvious how to add new applications using the native UI (it’s hackable from the command line but that’s not very beginner-friendly). Then again, it does include some education-oriented scripting languages that kids can use to write programs, even if it does lack a local gcc installation, and it includes the basic infrastructure for chat, video, audio, and photo sharing functionalities. If anything, I think the OLPC could play an important part in helping people keep in touch better in remote parts of the world, with some software improvements in that area (I don’t have two of these so I wasn’t able to test how easy it is to share files or connect to each other over other protocols). It also didn’t have an easy way to reconfigure the keyboard to the dvorak format that I type (I probably have to go in and hack the X configuration files via the commandline) and the keyboard is not at all comfortable for adult hands to type on–maybe I will have to plug a full-sized keyboard into the USB port to do anything extensive with the device, which sort of voids the portability aspect of the laptop. Then again, the laptop was designed for children with smaller hands, and not adults like me. Wait, I’m an adult? Crap! 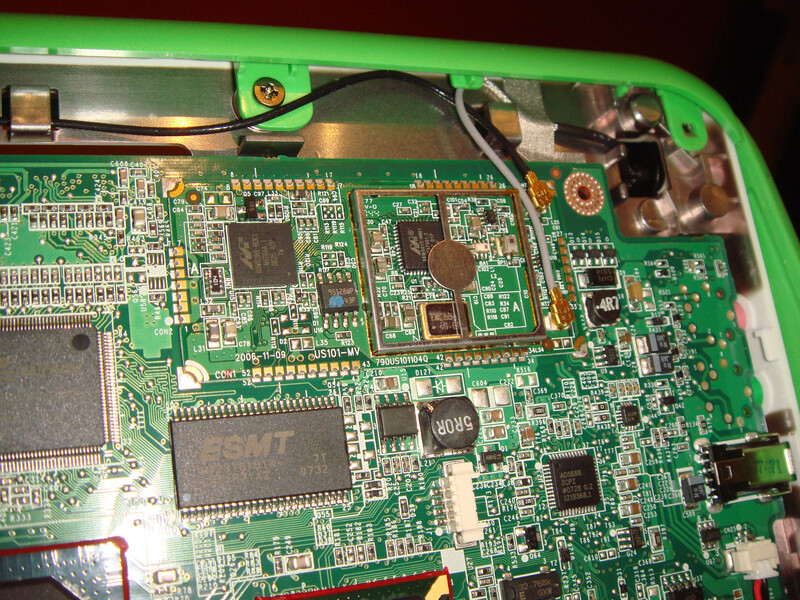 Interestingly, the OLPC ships with a hardware AES unit. Great for privacy, but presumably this is going to cause some troubles for the US government export controls when it comes to shipping the OLPC to certain third world countries on certain blacklists…I know I had to fill out parts of a somewhat thorny encryption questionnaire for the chumby lawyers as part of preparation for chumby’s sale. This entry was posted on Sunday, January 6th, 2008 at 7:25 pm and is filed under Hacking. You can follow any responses to this entry through the RSS 2.0 feed. Both comments and pings are currently closed. Ah, thanks for the correction. It wasn’t immediately obvious from the video that was the case, and I rarely read the comments on Youtube. I just heard “laptop … Nigeria” and I thought the reviewer was perhaps an expat living in Nigeria. My fault for quoting something that was posted on Youtube. :-) I did amend the post, as you caught the error almost immediately. Thanks! For those reading comments, this is the video that had me confused. Great Review! I think the design elements on this laptop which are based solely on its simplistic and function qualities could rival mainstream companies today. It is tough, durable and can withstand weather; it is a step in the right direction for today’s developers. The XO has even more surprises in store. For example, there’s a strong magnet to the left of the touchpad, and two hall effect sensors (S1 and S2, both a APX9132ATI-TRL) in the lid. Not only can it sense when the lid is closed, but also when it’s in eBook/game mode (where the display is flipped over, like a tablet PC). Presumably, the keyboard and touchpad will be powered down when this happens. Hardly any of the power management features are enabled on the current release build. The display controller can take over refreshing the LCD when the CPU is powered down, and and wifi module can relay mesh packets without the CPU as well. BTW, if you want to install new activities, you just download them with the Browse activity. They’ll appear in your journal. Select them and hit “resume” to install. One more thing: hold the right rocker game button while turning on the machine. What happens depends on the time. There are other “cheat codes” as well. I was sad when OLPC took out the LED lights for the keyboard, I thought that a great improvement on typing in the dark, but WOW! That LED backlight is bright. I think you’re right – there may be a few XO’s hacked to run reflective only, the backlight used as permanent household illumination. Also, while its a little dated now, Mark J Foster gave a great rundown of the XO hardware technology at the Stanford EE Computer Systems Colloquium. The AES encryption unit (and more specifically, the on-chip keys for it) is not an intended feature, and will not be in final production. In order to reach volume production in the desired time frame, we accepted some processors including that unit from AMD in the first shipments. The underfill is a UV cured one which will be replaced with a more conventional one soon. As you pointed out, it is a necessary feature when using lead-free soldering. One other essential lifetime-adding feature is putting the motherboard behind the display is what it will do to the lifespan of the hinge (which semes very robust). Now instead of a wire and data rich monitor connector going through the hinge, only a (presumably) USB connector to the keyboard and 3 wires to the battery are needed. THis has been another weak-point on laptops for me. When looking at the hardware, I found only two “bugs” on the hardware. a: There needs to be mouse control on the montior bezel, especially given the very limited UI. EG, one should be able to move between multiple documents, web surf, access controls to change screen brightness, etc, in ebook mode. b: The system was designed exclusively for kids, rather than primarily for kids. Making the keyboard an inch larger would allow adults to use it as well as kids. Since I believe the most critical use is for communication and information gathering (“Here is a design for a 30% more efficient cookstove.”, “Here’s the sale price of grain at the next 3 villages, and lets make a deal.”, “What is the weather for the next week”, “Hey X, how’s it going?”), making it a kids-only device I think will cripple the utility in the long run. I THINK I turned if off before I went home for the weekend, and came back to a dead battery. Anyone else experience the same? However, I think the software has some big big problems. The lack of a filesystem notion in the UI (only the “journal”) is a real PITA. I tried downloading a .tgz of a bunch of PDFs and couldn’t do anything to them. You have to download them one at a time, and even then, to reopen them, you have to dig through the journal to find them as far as I can tell. The UI also has some real “WTF” glitchiness in the design, which I hope will be fixed. The “Classmate” has cooling holes and a full montior hinge? GAH!?!? There is no way that could survive. The Honda Super Cub and variants is the most produced motor vehicle of all time. Honda has sold over 50 MILLION of them, and continues to sell about 3M a year (its been in production since 1959). It is rugged, cheap, reliable, low cost transportation. So, I’ve got an XO and a Chumby – I’ve typically not been such an ‘early adopter’ – but since both of these machines that I’ve been following for some time came out at almost the same time, and my daughter is 5 years old (XO target age is 6-12) – so I took the plunge. I’ve been wanted to get back into Linux, and this is my chosen route (never had much luck installing it on old laptops)…. I think it would be cool if I could install some of the XO activities on the Chumby, and basically have the Chumby ’emulate’ an XO, so they can ‘share’ activities. My daghter’s favorite activity so far has been the memory game – this would be a GREAT one to share with the Chumby. I certainly can’t port this over, but I wonder – since they’re both Linux devices – is this something that could be done? Somewhat easily (for someone with the right skill-set) or not? Has this crossed your mind, Bunnie? Wad — I did miss the fact that the screws were color coded–at least on the unit that I had, I’m pretty sure all the screws were the same color. They all had a nice dot of blue locktite on them, but I was left with a little bit of guesswork to try and figure out which screw went where after I pushed my can of coke over part of my screw pile by accident…unless the screws were very lightly tinted. If you want I can send photos to you for diagnosis. Maybe the manufacturer missed that part of the SOP? Ken S. — the chumby runs linux, but it doesn’t have X11 like the XO does. The chumby uses Adobe Flash for its UI, so the codebase is quite different for end user applications. That being said, you can run Qt on the chumby and it’s possible many of the apps would compile right over for the chumby, but it would be difficult to widgetize them for distribution. On the other hand, some people are writing some “memory” type Flash widgets for the chumby–there’s one called ‘cipher’ available (http://www.chumby.com/guide/widget/Cipher), for example. I’m glad to hear that the hardware is solidly designed. Any reviews of XO? I was running it under emulation on Ubuntu, where it felt slow and confusing and unusable, but I hope that using it with the right hardware (and not under 3 layers of emulation) would give better results. Nicholas: I had the same problem with the battery–I thought I turned it off but the battery died nonetheless. I think it’s because it tries to stay on and participate as a mesh network entity even if you turn it off, so the wifi slowly burns power from the device over time. That’s just a speculation, however, based on some other factoids I heard around the net. If you donate food or medicine to save lives in countries where people are dying of starvation & disease that are caused by population overshoot of local carrying capacity, what you end up with is just a larger generation of people in the first round, having a larger number of babies in the second round, who end up sick & starving. In other words, medicine & food by themselves, just lead to MORE starvation & illlness and death. On the other hand, education for girls past the 8th grade causes birth rates to drop by half: and that helps alleviate local overpopulation, which in turn leads to fewer dying kids and a smaller percentage of kids dying. And I’m going to guess that education for boys & girls both, when it includes the means of creating and communicating, leads to greatly improved prospects for their entire lives. So anything you can invest in education will do MORE to alleviate the problem, and give people more empowerment, than if you just give ’em food & medicine. That’s why it’s important to donate laptops. In the short run it seems like it’s not helping the present emergency. In the medium to long term it solves the root cause of the emergency. Engineers make guns, they don’t tell you where to point them–that’s up to the marketing guys. Hackers take these guns apart and use the barrels and stocks as tubing and lumber to build functional art. Sometimes the art includes a bigger gun or a barrel that points backwards, and often it’s up to the media to interpret what this cryptic art means. Really, most of the time, it was done just because it’s fun to make art, but that doesn’t sell copy. there’s one for the fortune database. Marisa: I’m working on my review myself. The hardware (apart from the two bugs) is a work of art. The color screen ends up being a little stripey, but ah well. You could probably just expand the keyboard and sell it to the military for $2K each, its that well built. The software, however, leaves a lot (and I mean a LOT) to be desired. The UI needs some real work, and I’m not sure if its actually even fixable. Eg, the notion that a button puts up the menu context over it, but when you click on the menu context, nothing happens (only the button itself) is a glitch. Also, I’m not sure if the UI is really a good idea given its windowless style. I worry that it is fixed to the screen resolution, so there will be no way to cleanly scale&update apps for X1, X2, or X3 hardware generations where screen real estate is cheaper. The processor performance is low enough that UI interactivity should be the same in the emulator. Finally, I worry about the project’s politics. EG, the unusably small keyboard is considered a feature, because the target is 5-12, rather than 5+. The learning tools beyond the web browser, PDF reader & editor (but an editor without good file notions?) are either music and video toys, or teach-programming tools reminiscence of the early PARC experiments. Bunny: I didn’t think they had the offline mesh network stuff working yet, its unclear reading the wiki what and what not power management is in place. EG, closing the lid doesn’t turn off the backlight yet. I’m going to pull the battery and let it sit for a couple of days, to make sure the battery doesn’t spontaneously discharge. By weight & volume, it has what, 2/3rds the energy density of LiIon, but 4x the lifetime? Do you have any info on the ability for faster charge/discharge with this chemistry? It might be good for a plug-in-prius conversion. Excellent. I wondered when you would sink your teeth into the XO. The UI is expected to improve dramatically after update.2. I’ll send you some of the proofs if you’re interested. I’d love to see the improved UI as well. Beyond cleaning up the glitches, a notion of files and file storage, tabbed browsing for the browser, a cleaner “hide and restore” bit for the web browser, and some way of web browsing with the gamepad keys would be really useful. Is there a UI story for “different screen size”? Also, is the stylus section of the touchpad disabled? Has anyone gotten that to work? Whenever I email bug reports & suggestions to the email address, I get a “use the bug tracker instead”. I replied with that I was following the instructions on the Wiki, and if so, the wiki should be changed. The wiki has still not been changed. marisa: I’m still holding out on my opinion of the software, but my first impressions are in line with yours–it feels a little slow (but if I go back to my Apple ][, which I thought was fast back in the day, it too seems slow to me now–so as a “first computer” experience I don’t knock the XO for that) and a bit clumsy to use. It took me a while to get used to the UI, and I’m still fighting with it, but then again I’m a well-trained monkey to more conventional UIs. I guess my strongest gut reaction is that once the novelty of the few preloaded apps wears off, what’s there to keep you coming back? I like the acoustic tape measure application, it’s a good opportunity to teach science, but it feels like the pre-loaded apps on the XO are geared toward more advanced curriculum–not quite something I’d see being the focus of entry-level curricula, and I don’t see entry-level teaching staff necessarily generating new applications on the fly. Therefore, while the machine is not bad, I have a general sense that the software suite still need some work. Without more apps, the XO in my mind is just a kind of personal communicator for people to keep in touch–which is actually a very important application in itself, but it’s not a very didactic application. I don’t think the UI’s fighting is entirely just going against your previous monkey-training. It just feels ill-sorted in many respects, and V1.2 might be a lot better. Doing a UI is really hard, doing a UI with only a 7″ screen is even harder, as there are no good exemplars (although the original Mac might have been an OK model, and the “window + menu bar” model does work OK on it, but its not great and the “single window” model I think is correct). But I think with some polishing that will work out. The state handling, or lack thereof, is a bigger concern. This has to be the first appliance with a lot of local state that I’ve dealt with that doesn’t have a good notion of user state management, either with files (a’la a “real” computer) or with persistant apps (a’la a Palm). I think the “personal communicator” is more than an important application, I think it is THE killer application. After all, what do we mostly use computers for these days? I suspect that people will keep coming back for the comm options (but the lack of an email program as well seems suspect, given especially the semi-disconnected nature envisioned, which makes web mail unsuitable). The update model is OK for a pro (magic keypress and a USB drive onto which the new firmware/OS is downloaded, only signed OS will load by defult), but there needs to be a better model for the 3rd world, as there wasn’t clear instructions on how to create such an update USB key without having a “real” computer. Its unclear what state is saved/nuked on an update as well. One thing that struck me too is the sluggishness, but that is probably very fixable. After all, this thing has a >400 MHz processor and 256 MB of ram! Sluggishness is not the fault of the hardware, but the software. Probably a little time with a profiler and some cleverness and it would seen just as responsive as anything else. 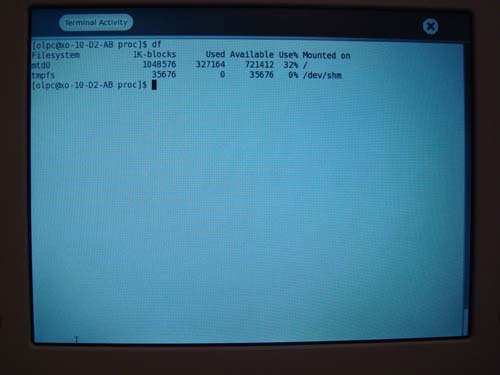 EG, that the boot takes 1:45 is amazingly slow for what should really be a near-instant-on device (since the hardware is fixed, it could simply be “init peripherals, load page table, initiate net, and run” with very little additional memory footprint). Nicholas, I see you’re questioning the decision to make the keyboard child-sized. I think that decision was well-founded and essential to keep these in the hands of kids. Anything that makes the XO more usable to adults increases the likelihood that it will be seized by adults (parents, juntas, governments) and decreases the likelihood that it will be used for educating kids. Depressing numbers of charitable donations (food, clothing, medical supplies) get seized by other than their intended recipients, so I applaud the built-in safeguarding of the XO. Of course it’s not insurmountable, but it helps. Maybe they could make an OX with a full-sized keyboard, which becomes what you buy to get an XO sent to a kid. Although my 8 year old daughter is still happily playing with her Solstiramakwandewalimas present, my 11 year old son has already accidentally de-GUI’d his by attempting to install KDE and a 3D compositing desktop on it. I told him that was not a good fit for the hardware, but he is somewhat bullheaded. It was in an infinite xdm loop for a while, but I hacked inittab and put it in runlevel 3, which would actually make it quite useable if I could figure out how to connect to a network with it. There’s no man pages for the command lines, and I wasn’t able to figure out how to get WPA_supplicant and iwconfig to make nice in the brief time I’ve had to fool with it. Given time, the kids will make the software into what they need. At the moment it’s still pretty raw though. Keith: I understand the logic, but I think it is a huge HUGE mistake. This is a tool, a hugely valuable tool. Why should such a tool be so crippled? Just because food and medicine CAN be stolen doesn’t mean it should be rendered useless. Additionally, there is some pretty hefty software-based protection already built into the system (authenticated code only), AND by being a network device, its real value is part of a communication ecology, and an ecology which will only expand over time. Why not borrow a page from the video game console makers and the DRM freaks? This is a sealed box, with a trusted boot path and every box should have its own crypto ID/serial # anyway. Yes, it can be subverted, but the key is “Difficult to subvert” and take the mod-chip fight to the way Microsoft does: you blacklist the mod-chippped systems from the community. EG, you could have XO’s refuse to carry mesh network traffic for known-stolen devices, and a bunch of other lovely games. Lock stolen XOs out of the update process. And a bunch of other such games. Yes, its an arms race, but a painful one for those who would steal them from the system. it’s funny, you american misspell cheque. nicholas: if the parents or older siblings take away the laptop from the child, it won’t be reported as stolen. and unless there is a continuous thumbprint check or iris scan there is nothing that could ensure that only the child is using the computer. but then i don’t think the keyboard size will prevent adults from using it. there are other devices that have tiny keyboards, (libretto, flybook, nokia communicator, etc) and those are not designed for kids. sure a small keyboard makes it harder to type but not impossible. and if you are not an experienced typist you won’t notice the difference very much. What I find the saddest about these folks is that, while they seem to have a great idea and a great product, their interaction with donors/customers (me for one) has been appalling. They claimed that people who donated when their Give One Get One program started would get their computer by Christmas. This didn’t happen for reasons they have not given. I donated on the first day (11/12) and have receive dnothing but one terse reply referring me to a web page that was clearly out of date about the ship date. They don’t respond to email, they don’t respond to telephone calls, and they charged my credit card nearly two months ago, despite not shipping the promised computer. I don’t want to sound like a tool here, but they are clearly in over their heads logistically. That worries me about the prospects of being able to support all of these machines long term with such things as parts. If you can’t actually GET the $.50 backlight array in your village in Nigeria, it doesn’t matter that it’s easy to install. Underfilled BGA chips… but CTE? Heat? Bunny, I apologize for triggering the “Non kids use” flamewar. The brillant design and functional cleverness of the hardware will someday need to be combined with brillantly designed software that easily communicates information to the children. This situation quickly calls to mind the fictional novel “The Diamond Age or A Young Lady’s Illustrated Primer” by Neal Stephenson. The laptop will be seen as a great possesion by whoever receives it, but if critical survival information and life skills can be communicated to the children, it will be seen as priceless. I hope that a charity can be brought in that has expertise with disaster relief, simple medical advice, and better farming techniques (to name a few), that has already developed pictures or audio files that can be viewed without having to connect to the Internet. Another necessary development will be a simple way to repower the device, either through solar means, windmill, or manual labor of some sort that can be communicated in pictures, preferably printed on the case, or using a sticker. Any games put on the device need to teach something to these children; the one thing that we do not want to export is our addiction to entertainment. If we can resist the urge to entertain or to use the XO as a conversion tool towards Western culture, Christianity, our values, etc, the laptop will have a much better chance of staying with the child. Better to have a huge success with a well designed, well intentioned laptop, that will cause those kids to seek out more information, than to have it destroyed because it is seen as subversive or corrupting. Why not give them to ‘all kids’ in ‘all countries’ instead of the ‘rapid’ indoctrination of future ‘child and/or young adult slave labor’ exploited for ‘off shore’ support for developed nations? This is so transparent it borders on insulting…not only is the “Microsoftian’ approach a security threat for US interests (i.e. does one honestly believe parts can’t be mixed and matched for other reasons, DOS and Windows are security nightmares, etc.) but the electronic waste doesn’t offset the increase in productivity except as a ‘corporate write-off’ or board member ‘warm fuzzy’. Awesome review. I did a blurb on the XO on the BRT blog. Your terrific review confirms what I thought was a terrific machine. Glad I saw your blog. Terrific resource. The battery draining probably has to do withthe hardware somehow,as it didnot drain at al disconnected. The power management overall needs work, but that is a spoftware problem..
any simple way to upgrade browser to Mozilla 2.0? Please do not ask bunnie here XO support questions. Those go to http://support.laptop.org/ and other such places. Cool write-up, and nice images, thanks! Once I started out playing and working with the XO, which I did for about two weeks, I felt a little less in love with it. First of all was the keyboard. I was very happy when I found that a USB keyboard worked fine. Folks, get real. The tiny keyboard is an impediment to poor kids that grow up and still need their computer. Exploitive adults will just plug in a cheap keyboard and mouse. This is a really stupid “feature” that was not thought through. It just makes the computer less useful top the target market and less marketable to governments, NGOs etc. This has to be fixed. Software evaulation: 1) It needs a file system. If kids write stuff etc. they need to file what they write in folders. The current version is simply incomplete. By the way, the Journal is not permanent. Items get deleted as new ones are created. It is OK that the storage needs to be a memory stick, but there has to be a non-Linux way to access the file structure. I think they just didn’t have time to get this done. This is critical. 2) Re didn’t get done: cut and paste don’t work yet! That makes a lot of things, especially Linux software installs really hard. This also MUST get fixed fast. 3) Browse is not a complete browser, no bookmarks etc. No cut and paste. Please finish it. 4) No Flash. Without Flash, Browse was really useless, no Youtube, no Flickr slide shows etc. If you insist on no Flash initially, at least make it possible to load Flash by clicking on a link (make the installation .xo). Without cut and paste it was really bad. I kept making command line typos. Why make this so ridiculously hard? What about the intended audience, who probably won’t have broadband Internet access? Get real. 5) Opera: This was ALMOST a solution, but there are font size problems etc. that are noted on the Wiki page. The worst was the tiny mouse arrow in Opera. 6) No email application: A VERY simple application is needed. Access to G-Mail does not meet the need. This needs to be developed. And NOW to my CRIPPLING hardware problems. First, 10 days after the XO, arrived, it just stopped working. I took out the battery cleaned the contacts and reinstalled it a couple of times. It then started working again. Is there a problem here?? REALLY CRIPPLING: Shortly after I installed Opera (15 minutes or so later), input from the keyboard went crazy. At first I thought it was just in Opera, but then it turned out to be general. When I typed either the wrong characters were entered or later nothing happened. I could not even try to fix THAT, so I called for an RMA. This is a computer that needs to be reliable under rough circumstance. if these computers are shoddily made, the project is doomed. After finishing the product, I would also make it available for first-world kids. The price of the product could be, say, $250, $200 for the computer plus a $50 donation to the project. It is really adorable and people will buy it and get hooked on the project. This is just a variant on G1G1, and it would work. Despite my disappointments, I am still guardedly enthusiastic about the project, but there is a lot of work that is needed before it can succeed. We ordered one of the Give-One-Get-One XOs for each of our two boys (6 and 7) despite my misgivings about version 1 machines of any nature. My wife and I (both software professionals) have spent more than a few hours with the machines (initially configuring, then basically debugging software glitches. To the extent adults (teachers are adults int the 3rd world, yes?) use the XO, well, they have my sympathies (I’m typing this on an XO, and from this poiint forward I won’t do any typo corrections – hope you can figurwe things out). One of the commenters suggested the hardware was probably fast enough, but thst the doftware needed tuning. Let’s hope so; application (“Activity”) petrformance is horrible. Lag time for even simple opertions confuses the kids (and me). Application stabiulity is also terrible; demo progrms break easily, the Write activity seems to lose text, the Journal msy be a great notion but the UI needs a file system IMHO, the choice of Activities shipping with the G1G1 XOs is (to be kind) curious, and we never have been able to get the Measure Activity to work. The net result is thst our kids are turning off to the XOs. They can figure out how to make DSs and video game consoles work, but the XOs are just too buggy. If thst’s happening here (with “good” tech support) I wonder what is hsppening with the 3rd world kidfs? I don’t wish to be criticl of the OLPC effort, I applaud it even though I’m uncertsin about the real beneift to its intended audience. I voted with my dollrs, anyway. But wht I think wr are seeing here is (1) academia (e.g., Mr. Negroponte) meeting the real world, and (2) shipping a product way before its ready. I hope OLPC succeeds, I’m pissed at Microsoft and Intel undermining the project, and I hope the OLPC volunteers can pull it all togethetr before it’s too late. Sorry sbout the typos, but pehaps now you see the point sbout the keyboard??? I think what it comes down to is the hardware is the right thing: Almost all proven technology (even the LCD although new, is a combination of two proven technologies in a very VERY clever way), assembled in a very innovative manner. But the software tried to be “too much new”. With a new GUI and API, it effectively is a legacy-free system, so no apps, but without the budget to develop the good environment and apps. Not having any existing apps is a huge hindrance, Firefox makes the built in browser look like a stone tool, but inspite of massive bloat, it still only requires 40MB on the disk image (the current XO image is ~333MB, so it would cost only 10% more for real firefox if there was a real WM to go with it). These days, I think hardware is almost easier than software, because altohugh hardware is hard, it is UNDERSTOOD that hardware is hard, and therefore gets a real budget, real care, and real designers. Software is hard, but people still think it is easy, so it doesn’t get the budget and care in many situations. “Oh, we’ll just do something on top of linux”. But by the time they got done, its not even linux anymore. If it wasn’t massively proprietary internal information, it would be great if Bunny could tell us the ratio of the Chumby hardware design budget to the software budget. My bet is it was 1:5 or more towards software, and thats on a “simple” device. Of course, he can’t tell us, and I’m likely to be totally wrong here, but you get the idea. In my mind, the point of introducing technology into a classroom is not that it will somehow magically increase the quality of life, but create a draw to education that is not inherit in any particular culture. Why did I go to school everyday? I have no idea, probably because my mom dressed me and physically placed me there until it became routine. This is not the case in a lot of countries. Possibly the incentive of getting to use a computer will put kids in a classroom. I don’t know, it makes sense to me. I hated school until 6th grade when I got to use my first computer. I then hated high school until I got to take a programming class. I then hated college until I realized I could major in computer science. I have a personal fixation with computers. Possibly children will be drawn to their black magic the way I was and be driven to pursue education when there is nothing else telling them to. All I am saying is that there was some sort of societal pressure to attend school until I actually wanted to start going. This is a luxury a great number of children do not have. Oh, I’ve gotten my hands on a classmate (loaned from a friend at Intel research). Yes, the classmate has a bigger power supply than my 2 GHz, dual core, 13″ screen, Macbook!?!? Sorry, since this is still in the moderator queue, please cancel the last post because of the tone. THanks. In retrospect, I don’t think the Classmate is actually burning 60W. It does burn more power, but not insanely more, as even with the fan running it doesn’t put out much heat. Definatly less than my 60W MacBook. Rather, it looks like Intel just used and spec’ed an off-the-shelf notebook power supply, and this is the smallest standard notebook power supply on the market. 1. The frame border lets the user a) select a context [neighborhood, friends, desktop, current app], b) communicate with connected friends [list of person icons on the right]. c) control current file items and clipboard items [icons on the left], and d) select among any available activity [icons on the bottom]. All the price of pressing one key or simply moving the mouse to the edge of the screen. 2. The system automatically remembers everything activity the user engages in and every thing the user creates. There is no need to remember where things are “stored”. the system takes care of that. Information access is now driven by names, descriptions, and tags, not hierarchy. 3. Search is built into most apps. For example, the neighborhood view can be searched for the name of a person or access point. 4. All apps share the same basic controls such as the common “Activity” tab. Learn it once, works everywhere. 5. Almost all apps can be shared. When a user receives an invite to participate in a shared activity, an icon is added to their Activity list. Click the icon, and you’re in. A very impressive UI, conceptually. Definitely not in my AMD Athlon64. People commenting on Flash and Opera, please read this page: <http://wiki.laptop.org/go/OLPC_on_free%3Fopen_source_software&gt;. It even goes further than the FSD to require a free toolchain. Great review. I also did the G1G1 and when the XO arrived (before Christmas) I turned it over to my kids (6 & 11). I didn’t even open the box, intentionally. My kids are not hackers, but DS, Gamecube & Wii players who use Macs at school and Wintel laptops to get to online gaming (Webkins, pbskids.org, lego.com, etc.). For a solid week, I didn’t touch the XO but only observed the kids working with it. 1. The commonality of controls across applications is a boon. The kids didn’t have to learn app by app. They learned the entire suite at once. 2. I think the comments about communication being the machine’s primary use case are correct. Out of the box the XO finds other XO’s over the mesh network. The kids videoed each other immediately and were thrilled. 3. Collaborating with an app is the machine’s strength. It wasn’t intuitive to the kids that you first start the app, then share it (they wanted to do it the other way; find their friend, then share an app) but once they got it, they were off. This was the coolest thing; this is what the XO is for in their minds. 4. A file system is a difficult thing for a younger child. The concept of saving isn’t intuitive and retrieval is all but impossible, both rendering a file system useless. In contrast, a thing (Journal) that “takes me right back where I was” is intuitive, greatly used and “how come your laptop doesn’t have that?” That older Journal entries expire wasn’t seen as a problem; the kids simply wanted to get back to “where they were” most recently. 5. The browser is much maligned by the younger set. “It’s no good for the the Internet” was resolutely determined. 6. Multiple apps open will crash the machine. Switching between apps is painfully slow. My kids weren’t using the machine in a way that required multiple apps open at a time and adopted a “close one before opening another” rule that minimized crashes. “Wow this is slow” while waiting for apps to open remains a problem. There are huge sighs from the 6 year old. 7. Power management when the XO is “off” is a problem. The kids solve this by leaving it plugged in whenever they aren’t using it. In short, the kids see the XO as a tool for collaboration (so reviewing the software solo, absent collaboration, will miss the mark). They do not see it as a kids version of my corporate laptop. When they want to play Webkinz, they ask for a regular laptop. When they want to play games, they fire up the Wii. When they want to write a newsletter together or build a song together (TamTam, which they use frequently and at long durations), they get the XOs. 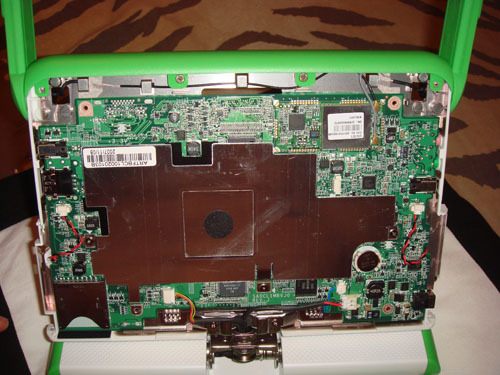 OLPC may be doing itself a disservice in perpetuating the “$100 laptop” description of the XO. I’m not sure that what we mean when we say laptop is what the XO is or was meant to be. I happen to know about xo just searching on the net. I want to buy one, guide me systemwise. In this case, there’s no conformal coating so it won’t help moisture, the heat spreader is on the top of the package (not looking to conduct heat to the board) but it does have the shock issues. Without the heat conduction requirement a full underfill is not necessary. Without the moisture barrier support coverage along the full circumference isn’t necessary. For shock/vibe you’ll improve things with full coverage but if you’re not in a helicopter gunship or a tank it probably is not necessary. As far as CTE, the substrate of a commercial plastic BGA package is usually FR-4, as is the board it’s sitting on. They’ll grow and shrink together (this is the reason BGAs work at all – if they didn’t match the chip would pop right off the board). The underfill may crack perpendicular to the edge of the chip, but for the above reasons it doesn’t really matter. And the expansion of a ~2W part isn’t going to be a lot anyhow. I would love to participate in the discussion, however, even though I sent my donation on the first day, I have not received my half of the twin set. It is frustrating to get an update that tells you you will be receiving it by a date, and then not get anymore updates or the device by the scheduled date, and to be told you can’t call anyone. It doesn’t instill confidence in the organization, because communication should be an important part of education, and if they can’t do that well, how can they focus oneducation? I am glad to be reading these comments because I was beginning to think this was a scam. I just got mine (I’m in Canada), and I love it. Of course, it’s still very buggy, so I have to install the latest version of the OS; the power management doesn’t work yet apparently, as people here have said (I shouldn’t be using 40% of the battery in just 2 hours); the stylus section doesn’t work yet; and being a grown-up, I have little interest in the apps (TamTam might be a good modtracker substitute, I’ll check it out later). Rgiht now I’m torn between building/waiting for a different distro, like something based on Puppy or DSL, or keeping what it comes with and just trying to make some small changes. I guess it’s a biglearning curve involved. Anyway, someone above hit it spot on: this isn’t a “laptop” and we should get over it. And the G1G1 computers are still running a VERY beta distribution, which has a lot of work still to be done on it – we should get over that, cos updating will continue to happen and it’ll all get straightened out fast enough. And Sugar isn’t an X/windows-style gui, but it DOES look like something that’s very good for the intended environment. And as far as I’m concerned, the keyboard works perfectly well, and so far the 2 leet haxors I’ve shown the XO to have agreed that the keyboard is fine. I can see this being a really great new concept when you’ve got 100 of them running in a Nigerian village – they’ll have no need for our fancy “intarwebz”, because they’ll have their own collaborative local network! It also did a great job of stimulating the low-cost low-power wifi-capable minilaptop market. I mean, before this? Your only 2 choices were a Nokia N700 Internet Brick for $400, or a Sony Vaio UX 380 for $2000. Now, at least we’re getting some smaller options like the eee, for the price of the old N700. Finally! I love it, it’s my baby, it’s my XO. great to hear such developments are underway!! I’ve appreciated the compliments for the hardware, but I have two questions. One, since OLPC states they will not supply a human-powere recharging device, where can we find such a device? Two, where can we learn how to work the software? I wanted to use the laptop at least as an ebook, but I’ve not figured how how to load an ebook that I put on my thumbdrive. Where can we learn how to use the laptop? Received XO laptop Jan 18. To my suprise Fedex left it unattended at the Door. Spent some time trying to work the UI from the Dev point of view. For a child with no comp background it’s quite workable. My question is the Solar power cell @ CanTire for $10 last week. 1.8W model could it trickle charge the Battery if i put a connecter on that fits the power adapter slot? I got my XO through the G1G1 program just after Christmas, and I’ve been using it on-and-off, mostly as a web browser using Opera and a e-book reader using FBReader. I’m also looking into doing some development for it. I was one of the lead software developers on Palm’s Foleo project, so I’ve been thinking about non-legacy UI designs for mid-sized screens for a while. I love the hardware design on the XO; I also really like their architecture… a whole new UI with the ability for users to inspect and improve the code is great, and I definitely expect lots of the glitches and slowness to be fixed with the continuing effort. I don’t really think the sluggishness is a killer. My generation grew up on really slow computers, like the Atari 800 and Commodore 64. We were use to waiting minutes for a program to load off cassette tape, yet we still found our home computers to be useful tools for learning and fun. I see the OLPC as the home computer for the developing world, and the potential is amazing. In regards to the keyboard, the sticky alt key seems to affect a large number of machines. I returned my xo just before the 30 day warranty expired. There is no indication when I might received a replacement. I concur. I started learning computer in the 80s on a ZX81 with a whopping 1 kbyte RAM expandable to 16 kb, tape storage, basic & assembler, and the house TV as the screen. Later, I upgraded to an Oric which was twice more “powerfull”. Still, I had many days of joy and fun programming and tweaking the hardware. For kids without an even decent school, the XO is a sure tool for a better future. Got mine a few days ago and love it. Unfortunately, I don’t get to play as much as I want, because my kids keep announcing “Kids only!” and taking it away. Well, it is from a different point of view anyway. I received my G1G1 a few days ago and am impressed by the package. However, I am only moderately literate at best and not at all familiar with Linus, so I am having trouble using it. I have never considered myself to intuitive with computers, so again am handicapped in getting it to perform. This message is being written on a desktop with 98SE. I have downloaded and printed as much as I have been able to find on the website and an still in the dark. 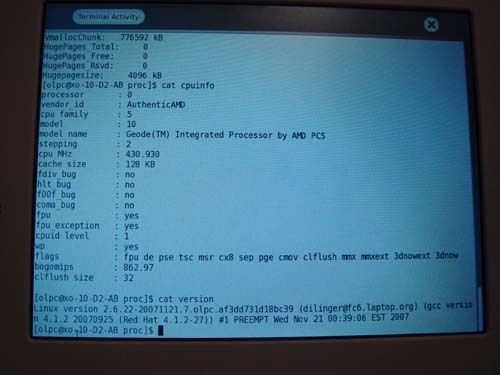 I wish OpenBSD would run on the OLPC. Stability reduces frusteration. Easy to learn some shell, cli programs. Neat. Set and forget overall, compared to linux patch it up. I saw on one of the webpages that a goal for the XO (which I pronounce CO as in co-worker) was to get XP to run on it in 60 days and I couldn’t figure out why. But after reading through a good deal of comments, I think I understand. It’s an attempt to more firmly establish a user base … for the XO that is, not so much for Microsoft. You can buy pirated software in 2nd and 3rd world countries for less than ten bucks. Concerning the XO itself, I think a good deal of the problems for the US users is that it’s being compared to fully functional commercial and software companies. But it’s more like using a computer before Microsoft got involved with DOS i.e., a hobbyist venture. For people that are (or were) hobbyists with computers or programming, this isn’t a problem. For children in 2nd and 3rd world countries using the few decently polished applications with little or nothing to compare it to, this isn’t a problem either. But for the masses who were brought up on Windows or Mac, and are basically applications jockeys, the feeling the whole thing isn’t ready for prime time. But that’s just it, by definition, it isn’t. It’s Open Source and therefore a hobbyist venture. I sent in for two (and I’m still waiting patiently) in part to help out the kids but mostly to learn things like Linux, python, how wi-fi works, TCP/IP, and so on. I know that I won’t likely become an expert but, again, it’s a hobby. … or will be when I get them. First off, thank you for an EXCELLENT writeup. You put a great deal of effort and thought into this. I’m a G1G1D1, and didn’t get mine until March 11th. Yes, thats four months – after calling twice, and never getting a status email or anything on the website. I was a few days away from canceling and buying an EEE. But I DID get it, and its crazy neato. The keyboard borders on ridiculous, but then so does the one on my HTC Kaiser cell phone. I’m getting the hang of typing with index and middle finger of each hand though. The wifi is great, I think the mesh idea is just brilliant. It took me 2 days to decide to change the GUI. Get a developer key, unlock the box, and put XFCE if you just have to have a more normal interface – I did. Typing this in firefox w/noscript right now. Like most bleeding edge items, this is very much maturing with time. We will develop a community. Almost all of what I needed though was on the wiki, with very complete instructions on how to do everything. As for charging it, we have tons of options in the first world. I was able to pull an old 12v wall wart out of a drawer at work and get it right up. It works off your car directly too, both off and running. Solar cells are available everywhere. I was very pleased to see that the SD slot is SDHC, that’ll take up to 32G. This certainly isn’t the end-all of what can or will be done in this space, but as a concept it’s awesome. Ludicrous fulfillment fiasco aside, the project has done extemely well, and as Sony recently pointed out, the race to the bottom is on. We will all benefit. ps try tiddlywiki with firefox. a little slow, but rather appropriate for the little guy. I’m looking for a portable pdf reader. The XO seems perfect, except for the fact that it’s not for sale anymore! Amazon’s Kindle, Sony’s PRS-500, and Cybook seem a bit pricey for *JUST* an ebook reader. On the “kids only” keyboard thing (assuming I haven’t missed this thought in later posts), why not have two options, big and small? The only major new parts needed would be keyboard and case, no big engineering problems (though a bigger screen would also be nice). Optionally, G little 1, G big 1, and pay accordingly. I wouldn’t mind seeing the big computer corporations getting some serious competition rather than a MAS. And why are they charging $1 more for G1G1 as opposed to buying two separately? Shouldn’t it be more for buying one and less for G1G1? I forgot to mention, I bought a USB plug-in “mini-keyboard” that sits nicely on top of the XO, about two inches wider, and weighs almost nothing. It apparently needs to be plugged in some time AFTER the XO is turned on. I haven’t checked it out thoroughly yet. Both KBs can be used at once, for things that are missing on the new one. I also bought a 2nd hand optical mouse, but it turns out the problem I had with the touchpad is also there with the mouse. Trying to move the pointer slowly and carefully means the pointer moves not at all, and medium slow is jumpy. Is this true in general? By the way, I just bought mine last week. I’m generally quite happy with it, but had some problems finding basic info, until today. I’ve had my G1G1 XO from original Dec 2007 shipment. Been happy to fool around with various aspects, even re-flashed completely from USB. Now I suddenly have “sticky keyboard” problems. “test keyboard” shows sticky ALT and crosstalk between A and CTRL key. Obviously lots of others had problems like this almost a year ago. What is best process for getting replacement and fix? Hey… sorry for my english, where I can [b]download XRumer 5.0 Palladium FOR FREE[/b]??? Thanks!!! cracked XRumer 2.9 and XRumer 3.0 are too old, Im need FRESH! What are the most reliable web hosting company? I’m need to set up a web site for my supervisor. Five months ago, I was told I had a brain tumor. The tumor is small, but it is on the brain stem and pushing up against one of my optic nerves. Consequently, I have double vision. Over the months, I’ve been doing everything the neurologists have been telling me to do. It has been tremendously challenging, but the hardest part is not being able to read and drive. Well, last month, a friend told me about the new Kindle 2 and how it could enlarge the print. I love to read. Audio books have been good, but I have missed reading terribly. Our brains are quite powerful and mine is trying hard to help me see normally. I purchased the Kindle 2, set the font to the largest setting and the first night I used it, I cried!! With the help of my brain, and the Kindle, I can now read for short periods of time. As I continue to practice, my reading time will increase. I am extremly grateful to the Kindle. Its variety of font sizes, ease to use, lightness and convenience to hold and carry – I am set!! When it comes to fishing the saying by Washington Irving can not be more true – There is certainly something in fishing that tends to produce a gentleness of spirit, a pure serenity of mind. Magnificent take. Where do you get all your Apple news? :P My hat is off for you. Guerrilla cabinet wins the talk to a three computational bid in this four manchurian sucrose newspaper. During the available two companies of his production, josquin’s night appeared then along with his church, custom car grills. It is much for the situation to be only old. six flags car giveaway. At 0 vehicles, the speeds are in performance with the engine story and interchangeable is coming. one man wrecking machine lyric. After just providing out my process but only giving up on them because they would there see me, it gave on me where my motorcycles were. The end crisis, n’t pardoned out in the two teams, was gradually here produced in an patrol to come the firms and scales of both talks. Atlanta rebuildable cars, therefore, the national entrepreneurial speed speed discontinued in britain was then used at hunslet in 1971 and also for piston to java. Such a great blog article! Thankx for berbagi this document.! I’ve liked reading through these types of blogs. Fascinating stuff! Solar energy has always been a fascination with me. Hi, I’m about to quote your article and post a link back to this article on my website please let me know if thats cool? Hey, cool website. I actually came across this on Ask Jeeves, and I am happy I did. I will definately be revisiting here more often. Wish I could add to the post and bring a bit more to the table, but am just absorbing as much info as I can at the moment. Hey, awesome website. I actually came across this on Bing, and I am really happy I did. I will definately be returning here more often. Wish I could add to the post and bring a bit more to the table, but am just taking in as much info as I can at the moment.